QCI has been ISO17025:2005 Accredited since 2008. Quality Calibrations, Inc. is very pleased to announce that we have recently undergone an extensive accredidation process and received our ISO17025 Certification in November 2008. Quality Calibrations Inc. is accredited by the ANSI-ASQ National Accreditation Board (ANAB) provides internationally recognized accreditation. This is our ISO17025:2005 Certificate of Accreditation and ISO17025:2005 Scope of Accreditation – these are required to work for police departments and all forensic labs in the world. This is our District of Columbia General Business License which allows us to legally operate in the District of Columbia. Maryland Office of Minority Business Enterprises (MBE). The Maryland Department of Transportation (MDOT) directory of certified firms is intended to be used as a guide for identifying certified Minority (MBE)/Disadvantaged (DBE)/Small Business Enterprise (SBE) firms and Airport Concession Disadvantaged Business Enterprise (ACDBE) firms to utilize on State and/or USDOT assisted contracts. Information in the Directory should be verified with the MDOT Office of Minority Business Enterprise (OMBE). NWBOC was established in 1995 for the purpose of increasing competition for corporate and government contracts through implementation of a pioneering economic development strategy for women business owners. 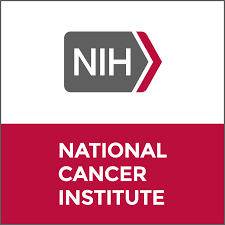 NWBOC is a national 501(c)(3) not-for-profit corporation, and is the first third-party, national certifier providing WBE Certification. Having WBE Certification is the only way the purchasing agents have confidence that a business representing itself as woman-owned is in fact woman-owned. 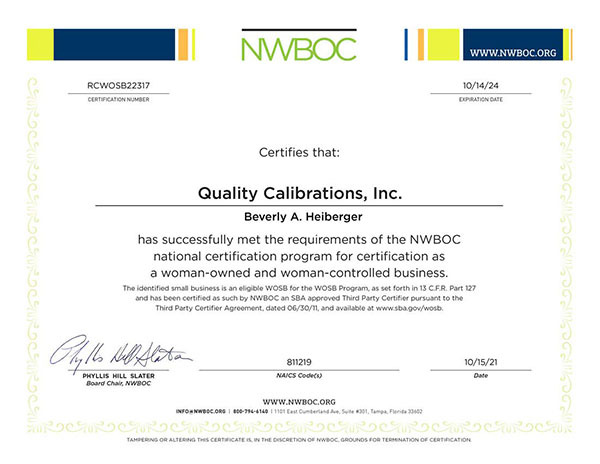 Quality Calibrations is a NWBOC certified woman-owned small business. 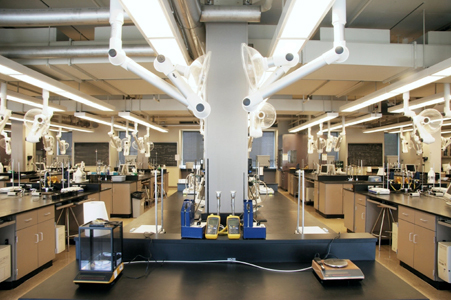 If you need further information or would like to speak to us about your pipette calibration needs, call us at (877) 747-3883.